The Spice Who Loved Me: Ayurveda Series: Ginger! This has to be one of my favorite ingredients of all time. I use fresh ginger upon waking in my Masala Chai, I shred fresh ginger in my kadhis, daals, curries and lassis....I even eat raw shredded ginger mixed with fresh lemon juice to give my digestive system a lift. This is one ingredient that should be on your 'must-have' list! 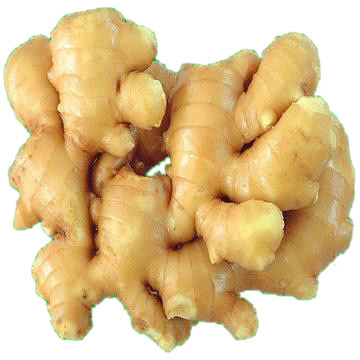 According to ancient Ayurvedic texts, Ginger is thought to be the 'universal medicine'! Ginger boosts circulation and digestion and also helps alleviate Joint pain. (Source: 'The Sweet Smell of Success', by Dr. James Geiger). Since it is a 'warming' spice, it is advisable to have it in smaller amounts each day for a "Pitta" and "Vata" constitutions. Those with a "Kapha" constitution can use it freely since it aids digestion! For an in-depth explanation of the Kapha, Pitta, Vata and Tridoshic constitutions, I suggest reading Monica B's Ayurveda website in order to familiarize yourself. I have been a fan of Monica B for a long time now and her knowledge of Ayurveda and using it in the daily routine inspires me greatly. A must read if you are into this as much as I am! Here is the recipe for the Ginger tea that I drink daily in order to keep my metabolism in check. You will find this recipe on my home page as well. Roast equal amounts of Cumin, Fennel and Ajwain Seeds and powder them in your coffee grinder. You may omit the Ajwain seeds if you like. Add an equal amount of Ginger Powder to it and mix well. For variety, I also add some cinnamon, black pepper or cardamom. To Prepare: Boil some water and add some of this mix and let it sit for 5 minutes and sip slowly. You may add some lemon juice or honey for flavor. Be sure to add the honey when the water is warm. Drink throughout the day to keep snack cravings away and when your digestive system seems sluggish. I add this mix along with the fruit teabags to create new flavors and keep it interesting! Please Consult your physician before taking any supplements or trying out any remedies. Occasionally we make lemon tea and I like the zip that ginger adds. I try to limit the usage as I am a 'pitta' person and I know the side effects well.